In honor of St. Patrick&apos;s Day, Grainne ni Mhaille (Grace O&apos;Malley), the Irish Pirate Queen. She met with Queen Elizabeth and was given a pardon for her pirating, despite the bounty on her head. 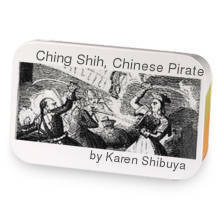 Grainne Mhaille, Pirate Queen has hooked up with Ching Shih, Chinese Pirate. Love Grainne Mhaille, Pirate Queen? This is just one of 5 teas in this fandom. Check out the whole series.